Happy 2018! Today, I'm not going to talk about anything book-related. If you are just here for bookish fun, please feel free to tune me out. Today, I am talking directly to my soda drinkers. Did you make a resolution this year to quit drinking carbonated beverages? Are you addicted to Diet Coke, Pepsi, Mountain Dew, or Dr. Pepper? Do you want to stop, for good this time? 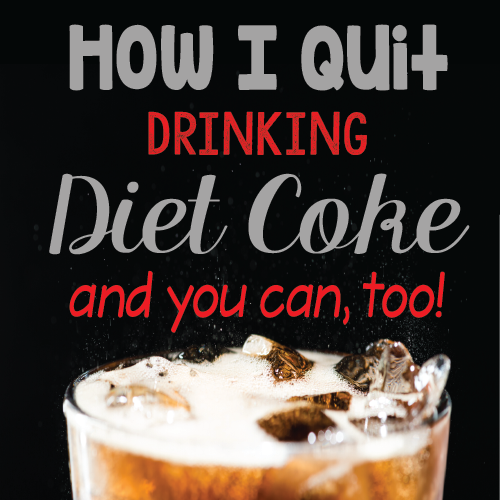 I'm going to tell you a story today about how I got addicted to Diet Coke and how, after over 25 years of serious addiction, I was finally able to kick the habit for good. Believe me, if I can do it, so can you! If you've followed my blog for a long time, you may remember a little Diet Coke Detox journal I did on this blog way back in 2012. That time, I was able to break the addiction for maybe a month. Since then, I've tried probably once a year or so to kick this habit permanently. And I've always failed. When I was a kid, I drank loads of milk and water. It was all we had in the house, so I didn't have much choice. Soda was expensive, and it was a huge treat when we got it. But when I started working as a restaurant server at age 15, I was thrilled to discover that restaurant staff could drink unlimited soda/tea/lemonade during our shifts. I went wild for soda, particularly Coke. For the next 25+ years, I would average about six cans of Coke--and later, Diet Coke--most days. I loved it so much that I called it "The Precious," just like Gollum's ring in The Lord of the Rings. When I still lived in Texas, I regularly bought Sonic Route-44 Diet Cokes with vanilla on my way to school, and I would drink nearly all of it by the time I went home that day. Over the years, I tried many times to kick this addiction, but it has never lasted more than a few weeks. I would always cave, missing that burning feeling of icy-cold Precious trickling down my throat. I knew I was addicted, and I hated it. Like Gollum, I was a slave to The Precious. If I went more than a few hours without one, I got headaches. Whenever I tried to quit, I spent the first few days trying to function with constant sharp headaches, fatigue, and even dizziness and nausea. HOW DARE YOU DRINK ONE OF MY DIET COKES? On December 22, 2016, I drank my last Diet Coke, ever. I'd finally just had enough of my addiction. Diet Coke is available here in China, but it's just a little more difficult to get than it was in the USA. Our fast-food restaurants do not have "super-sized" sodas, and they almost always serve Coke Zero instead of Diet Coke. Not the same. I've never seen a 24-case (or even a 6-pack) of any type of soda here. It's always single cans or single 20 oz. bottles. Two-liter bottles are available in some places, but it's always Sprite or Fanta Orange or Coke Zero, not Diet Coke. To purchase Diet Coke, I have to buy individual cans at the store. We don't have a car here (don't need one), so I have to lug home any Diet Coke cans I buy. Since I purchase other items at the store as well, the weight of groceries limited my Diet Coke purchases to maybe 8-10 cans at a time. At my rate of 5-6 cans/day, I needed to walk to the store every other day, just to replenish The Precious. And when my husband drank one of my Preciousness, I would get SO ANNOYED. I knew it was stupid, so I didn't (usually) say anything, but inside, I was boiling. How dare he drink one of MY DIET COKES? By December 2016, I'd had enough. I had quit The Precious before, but I always went back after a few weeks. But this time felt different. I was just so tired of being such a slave to it. I quit cold-turkey, replacing The Precious with soda water and grenadine or fresh lemon. It worked. By March, I was down to 1-2 cans of soda water with lemon each day, and by June, I wasn't even drinking the soda water all. I had finally, finally thrown The Precious into the fires of Mordor. Even better than that, I had managed to replace The Precious with--gasp!--water. I drink only water and one small coffee each day now; no soda at all. I was SO PROUD of myself. If I could quit The Precious, I could do anything! It's been over a year now, and I haven't had any Diet Coke. I can't have any, either. Yes, I do still sometimes crave it. Yes, I do miss the throat-burn of an icy-cold Precious trickling down my throat. But I am 100% positive that I will never drink it again. I recognize now that, like a former alcoholic or smoker, I may always crave it. If I give in even one time, I know I will go right back to it, and all this will have been for nothing. From now on, I will celebrate Dec. 22, 2016 each year like it's my birthday. In a way it is. When I say that I feel like I can do anything, I mean that deeply. Since quitting the Diet Coke last year, I went vegetarian in August, then vegan in October. The vegan-thing is really a post for another day, but quitting Diet Coke gave me the mental strength to know that I could do it. Six months ago, I would have scoffed at the idea of not eating cheese or hot dogs or sour cream anymore. Six months ago, I rarely cooked at home. But now, I'm down nearly 20 pounds since August. My acne-prone skin looks absolutely amazing. My hair is shinier and stronger. I have more energy and almost no body odor (crazy, right?). I have the energy to get up at 4am every weekday and walk for an hour before getting ready for school. All this started with kicking Diet Coke to the curb. No lifestyle change--not even giving up cheese and sour cream--could possibly be as difficult for me as getting rid of The Precious. I bet many of you have made New Year's Resolutions to quit drinking your soda-of-choice. It's January 2nd today, and some of you may have even already broken your resolution to quit. If that is you, please don't give up! You CAN do it, even if you fall down from time to time. People who are not addicted to soda do not understand how strong the addiction grips us. What makes it extra-hard for soda is that it's socially-acceptable. It's not like smoking or excessive drinking or drugs. Probably no one is going to frown at you in disapproval for cracking open a frosty can of Mountain Dew. How could they? They are probably addicted, too. Decide when you will quit. It doesn't have to be today, and it doesn't have to be cold-turkey. You will have headaches for the first few days, so the timing is important. If you've ever quit before, you know these headaches can be very painful. Plan to detox over a long weekend (maybe MLK Day coming up?) or maybe take a couple of days off of work to do it. Or, if the headaches are just too much, you could cut back your consumption over a couple of weeks. What works best for YOU? Set some rules for your detox. For me, I allowed myself to drink anything except caffeinated soda. I already don't drink alcohol, but coffee was okay and helped stave off the headaches. Smoothies, fresh juices, and soda water with lemon will also make your detox easier. Water, water, water. I didn't drink much water before I detoxed. If you are the same, you are most likely dehydrated. Your headaches will lessen the more water you drink. People here in China drink hot water often. When we first moved here, I found this to be weird, but now, I love a mug of hot water with a little lemon. Don't knock it till you try it! Soda should not be available to you at all, especially in the first few weeks. Do not keep it at home. If there is a vending machine at work, you'll need a plan to deal with that in your weak moments. What can you drink instead? Coffee? Tea? Ice water? Juice? Or maybe you can plan to take a short walk when you crave it? Again, make a plan that will work for YOU. Keep a journal of your detox. What do you notice about how you feel? How are your headaches? Does your skin look better? When are your cravings strongest? Writing it down will help you get a handle on your emotions during this critical time. It will also help you remember your detox process in case you ever need to repeat it. Hot drinks were my BFF when I was detoxing. I already mentioned the hot water drinking that happens in China. If that's not your thing, you could also drink hot tea, cider, coffee, or broth. Before I went vegan, chicken broth in a mug was my favorite thing to drink at work! There is nothing more soothing than a steaming mug of liquid deliciousness on a cold January day! Celebrate milestones, especially the little ones. Getting through the first day is a milestone. What can you do for yourself to celebrate that? How about at a week? A month? It doesn't have to be expensive or time-consuming. A smoothie or a new water bottle or a funky pair of new socks are easy, cheap ways to reward your progress. Decide your rewards beforehand so you have something to look forward to. Don't be afraid to reward yourself each day if that will help you! Try to avoid places where soda-drinking is likely. Going to the movies is one place where it is really difficult to not order soda. Avoid the cinema until you can get your addiction under control. Go to a bookstore and get some herbal tea or coffee instead. Tell people you are quitting and talk about your journey. It's harder to backslide when your family, friends, and coworkers know you have quit. After sharing this blog post, how could I ever go back to it? Maybe your journey can inspire others to quit, too! Don't beat yourself up over weak moments. If you do break down and have a Precious, hang in there. You had a moment, and now you feel guilty about it. That's no reason to give up and keep on drinking it. Recognize that this is an addiction. Failure doesn't happen just because you drank some soda one day. Or two days, or even a week. Failure can only happen when you stop trying. Forgive yourself and move on. Use the weak moment as a learning tool. What made you drink it again, and how can you avoid this pitfall next time? Recognize that this is a lifelong addiction. Like an alcoholic or smoker, you will backslide if you ever drink this stuff again. Maybe that seems extreme, but for me, that's what it is. It's not that I don't want a Diet Coke today, it's that I cannot have a Diet Coke today. I know that even just one little taste could put me right back where I started. Knowing that, I won't put myself in that situation again. It's simply not worth it. I'll end by saying that this is a post I've wanted to write for a long time. I'm obviously very passionate about it, but I worried that my bookish readers would not be interested in my nutritional choices. It's okay if you aren't. If this post speaks to even one of my readers, I will consider it a great success. I'm hoping someone is reading this right now and thinking that this post could have not have come at a better time. If that is you, I promise you that you can do it. It won't be easy, but there is support out there for you. I am here for you, and I am betting you have family members or friends who will support your goal to quit. There are probably some online groups for soda addicts. I just searched FaceBook for a soda-quitting group, but most of the groups I see are very small, closed groups. I'm willing to start a group on FB if you are interested--let me know in the comments! Here's to a happy, soda-free 2018! You are stronger than your addiction and you CAN do it! Congrats on quitting soda! We didn't have it either when I was a kid, just milk and juice. I'm not a soda drinker but I can relate to everything you've talked about. I have my own smelly addiction I need to get rid of. Smelly addiction? Hmmm...not sure what that could be! Best of luck with it! Yes! I quit both added sugar and artificial sweeteners about 7 months ago and I truly believe the reason I've been so successful is that I post about it monthly. I also focus on non-scale victories as well as my weight loss (32 pounds and counting). Go, Amanda! Wow, 32 pounds is nothing to sneeze at! Congratulations! Thank you for your post! When I was a kid, we didn't have sodas. Just milk, sweet tea, and water. Dr. Pepper is my Precious. :) It does seem to be more of a convenience or "comfort drink" at times. This is the year to put an end to the extra empty calories and sugar. I worry very much for today's children who do have access to fizzy drinks all day long. How hooked will they be when they are adults? I didn't quit all pop, just sweetened. Regular Pepsi and Mountain Dew are my favorites. I don't really like diet pop, but have had a few for when I just need that bubbly taste. It has been 2 weeks tomorrow since I've had a regular pop. Hoping to achieve your level of success. The addiction is real. No doubt! Whatever your journey looks like, doing something is much better than making no changes at all. Two weeks without your addiction of choice is a great step in the right direction! This is probably terrible parenting, but we don't have soda / fruit juice (which is just as bad) at home and my kids can drink tea, milk or water. Since my kids turned 10 we actually pay them $100 per year that they don't drink soda. Yes, extrinsic rewards I know I know, but so far it's worked and they're 14 / 16 respectively and still turn the nose down at soda - and $100 isn't even really that much, more a token but they're quite proud of getting it on their birthday as a bonus each year. I guess it helps that neither of us have ever developed a soda habit so it's never been "a thing"
So so awesome! Great encouragement for everyone! I personally don't drink pop (we call it here in Canada...lol) much but I do have it on occasion. I know it is terrible for you. Because I am plump (my positive for overweight...lol) and could stand to lose 50 lbs, I cringe every time I slug one back as the sugar content is horrendous. So, kudos to you and a great inspiration for all of us! Thank you for writing this. I drink one Coke Zero per day, so it’s not awful. But I’m thinking I need to quit all sugar in 2019. Cold turkey works for me- I quit it for over a month last spring- and someone’s birthday cake made me go back. Thank you for this post. I really am glad you blog about everything! Good luck with the no sugar! That's a tough one, but such an admirable goal.